I don't know about you, but I love love love a good biography. Whether it's a book or a film, I enjoy hearing about people's lives. I'm not prejudice about subject matter either. The stories could be about Clint Eastwood, Dr. Dre, or Ben & Jerry or they could be about Noam Chomsky, Whitey Bulger, or Pierre-Auguste Renoir. The person's notoriety isn't as important as the story itself. A case in point, the film biography of Wayne White. It's called Beauty Is Embarrassing and it is important. Wayne White is a name you probably haven't heard before, but you may have seen his work. 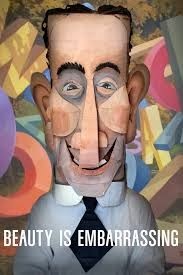 He was a puppet designer, puppeteer and set designer for Pee-wee's Playhouse. He did animation work for Pee-wee and other kid's shows. He also did the animation for the Smashing Pumpkins' video Tonight, Tonight and Peter Gabriel's video Big Time. Wayne is a painter, sculptor, illustrator, musician, public speaker, and an all-around great guy. He cusses a lot but it isn't malicious. Like me, its just how he talks. Wayne was born and raised in Chattanooga, Tennessee. He had a long career of television work on both coasts but decided to scrap all of that and move back to his home state. There he and his wife, Mimi Pond, (a prominent illustrator herself) their son and daughter all live creative, artistic lives. If you are an artist, a musician, a business person, or you wish you were, this is a fantastic documentary for you to watch. Wayne has been through the wringer that life often gives creative people and has come out the other side playing the banjo and singing. If you need a little inspiration to motivate you into being the creative person you want to be, watch Beauty Is Embarrassing. It's streaming on Netflix, but it's a film that I have ordered so I can have a copy to watch if they ever drop it. I don't want to forget a film like this. I hope you enjoy it too. "This place is so beautiful it hurts my feelings." - Wayne talking about Tennessee. With the dawning of a new year, I have decided not to make resolutions other than to be a better Jonathan than I was last year. Better at whatever it is I decide to do. One thing is to be a better wine lover. I personally enjoy most varietals and sweetness levels of wine, but my preference is dry red wines. They are just more compatible with my senses. I can, however, taste the driest natural Champagne in the same sitting as the sweetest Sauternes or Ice Wine. If a wine is good, I will drink it. If it's too sweet, I won't drink much of it, but you're really not supposed to. This New Year's Day, I opted for something a little sweet since my drinking partner thinks dry Champagne tastes like vinegar. No amount of samples and instruction from me will change her mind, so I picked out a sweet sparkler to share. It is one of the best and most overlooked sweet wines in the world, Banfi's Rosa Regale. Brachetto grapes have been growing in Italy for a long time. In a certain vineyard in the Piedmont (Piemonte)area in northern Italy, they have been growing these grapes annually since the mid 18th century. In 1979, John and Harry Mariani acquired the vineyard for Banfi Vintners and renamed it Vigne Regali. Since then, they have honed this 100% Brachetto wine into what I had as my first wine of the new year, Rosa Regale. 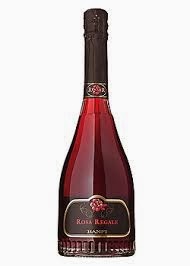 Even though Rosa Regale is categorized as a demi-sec or semi-sweet wine, it is so rich and fruity that the brain is tricked into thinking it is sweeter than it actually is. (All that is based on sugar content, not taste.) That didn't stop me from enjoying the heck out of it. It is a darker rosé and is packed full of wonderful tiny bubbles. The taste of Rosa Regale is akin to a raspberry jam, full of fruit, pleasantly sweet but not overly so, and as smooth as they come. I have heard in the past that this wine is the absolute perfect wine to have with chocolates, so that's exactly what I did. I had a couple of dark chocolate truffles that I paired with one glass. They, whoever they are, were correct. Chocolate and this wine are made for each other. I didn't want to stop there. One of my traditions for the new year is Blueberry Pie...long story, but it is. So I poured another glass, got a piece of warm pie with whipped cream, and enjoyed them both immensely. The fruit of the pie and the fruit of the wine made the first day of the year very fruitilicious. They have Rosa Regale available in split bottles that are half the size of regular bottles. However, the big bottle would be the perfect addition to a Valentine's Day box of chocolates. Hint Hint, gentlemen.